As discussed in the fall 2018 issue of Trustee Quarterly, community colleges are designed and organized differently throughout the United States. In many states, each college operates independently, or through satellite campuses that constitute a single local community college system, but only four states have no state governing or coordinating boards. Thirty-two states have some combination of state and local governance for community and technical colleges. Eleven states organize all of their community colleges into singular statewide systems, comprising about 22 percent of the boards across the nation. Some are exclusively for community colleges, while other states have higher education boards whose scope includes public four-year colleges and universities. New Hampshire, for example, has seven community colleges governed by the Community College System of New Hampshire (CCSNH). “Having a statewide system has enabled our colleges to do more with limited resources, to enhance student success efforts in partnership with and with funding from national foundations and federal grants, and to be a unified major contributor to the state higher education attainment goal 65 by 2025 and economic goals,” says Chancellor Ross Gittell. This article is intended to help higher education leaders understand the nuances of different governance structures in different states, as well as what community college governance has in common everywhere. To better understand the nuances of different state governing system models, we must first look at them structurally. Differences often depend on system size, the number and type of institutions involved, student enrollment or capacity, and of course, state budget allocations. Governing board sizes and terms also differ. In New Hampshire, the CCSNH governing board is comprised of 36 members, of whom 23 (including two students) are voting members nominated by the governor and confirmed by executive council. The remaining 13 ex-officio trustees include the governor, the chancellor and vice chancellor, three state commissioners, and the presidents of each community college. Along with governing boards, some — but not all — of the 11 states with state system models also have local campus advisory boards, which may advise on or perform similar functions as the state boards. While the state system trustees, for example, typically allocate state resources, set tuition rates, and develop statewide policies for higher education institutions, the local advisory or campus board may recommend the budget for approval, recommend certain executive hires, and generally monitor college adherence to the state plan for higher education. In some but not all state systems, local boards work either in tandem with statewide boards or work independently at the regional or institutional level to advise and coordinate. 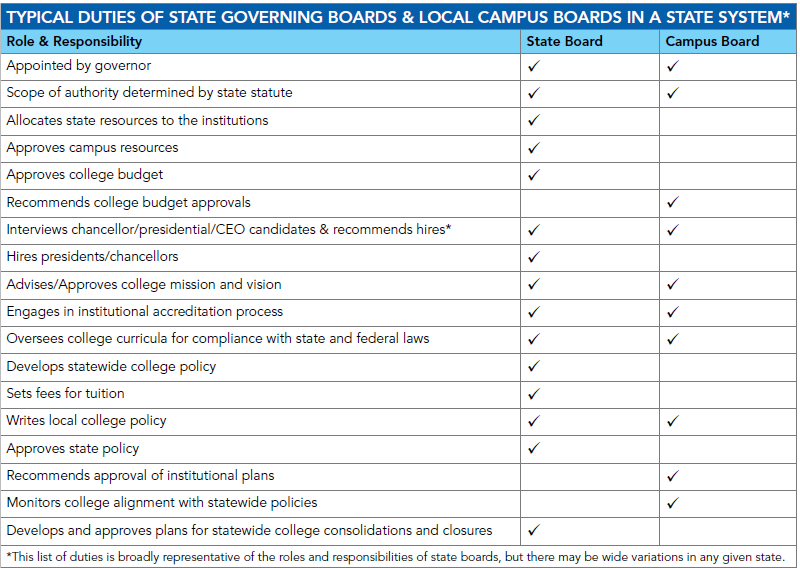 Many of the basic responsibilities of state and local campus boards are identical. Each has to act as a unit, conform to a code of ethics, be mindful of monitoring rather than micromanaging, and so on. According to several college presidents, local board members often participate on screening committees and get the first shot at interviewing presidential or chancellor candidates. The actual hiring, however, is typically completed by the statewide board. In many states, the local board maintains its advisory role separate from the state board. Each state system breeds its own unique practices. Connecticut, for example, is an example of a state system with local campus advisory boards. The Connecticut Board of Regents (BOR) for Higher Education governs Connecticut State Colleges and Universities (CSCU), which is comprised of four state universities, 12 community colleges, and Charter Oak State College. (The state’s flagship university, the University of Connecticut, is governed by its own board). The Board of Regents is made up of 19 members, nine of whom are appointed by the governor, four by legislative members, of whom one is a specialist in K-12 education, and two by its student advisory committee. Six members are ex-officio non-voting members: commissioners of departments of economic and community development, public health, education and labor, and the chair and vice chair of the system’s faculty advisory committee. Indeed, the main function of the Nutmeg State’s local campus advisory boards is to advise and coordinate academic programs for the state’s approximately 53,000 students. Each college has a regional or local campus advisory board and foundation board for local decisions involving coordination of programs with local employer needs. The local board members guide programs for curriculum development and local input on construction projects; the foundation boards help with fundraising. NCC’s local campus board is a combined regional advising board and foundation board whose major task is fundraising. “We raise the most money in the system, and it is very productive to have this local board,” Levinson says. Along with the scaling benefits at the state level, Levinson praises the role of local boards in determining their institutions’ programs and local policies. “Campus boards keep that local flavor,” he says. Vermont, which has a small state system without local advisory boards, prides itself on being unified, sleek, and tightly regulated to reduce redundancy and expense for the 12,000 students in the state, 10,000 of whom are natives. Headed by a longtime Vermonter, Chancellor Jeb Spaulding, the Vermont State College (VSC) governing system is comprised of a 15-member state board of trustees, including the governor. Board members have four-year terms with no limits. The chancellor’s office regularly communicates areas of opportunity for growth and expertise gaps on the board for consideration as the governor casts a wide net for board candidates. Five of the board members are appointed by the governor, four by the board of trustees, one is selected by constituency groups, and four legislative ex-officio trustees are members of the General Assembly, including the governor. There is one student trustee who can vote; this person is elected by the student government associations of all four state institutions: two four-year liberal arts universities, one state technical college, and one community college that has 12 learning sites across the state headed by coordinators. Institutions may not be autonomous if they are part of a system. As a specific example of the benefits of a single state board, Spaulding points to the recent consolidation of two separate institutions (the Lyndon and the Johnson campuses) into one: Northern Vermont University. “The board made that unification more doable,” he says. “The two sites doubled their power, connected classrooms, and students now have more access to more classes.” For a small state like Vermont, he says, not having local boards keeps the system streamlined. The board of trustees hires the chancellor and the presidents, but the Vermont chancellor can remove the president with approval from the board. 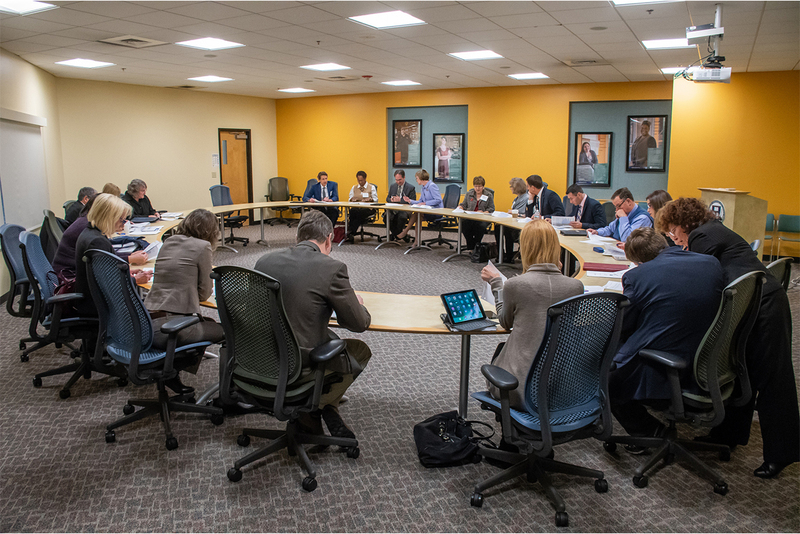 Selection of the chancellor and the presidents is a major role of the board, yet the chancellor’s office runs the search committee and tries to keep the trustees involved all the way. “This is one of the most important things we do — making sure the system has effective leadership,” Spaulding says. “It’s critical for the CEO to have a tight relationship with the board chair and talk on a regular basis." Michigan is one of four states without a state governing or coordinating board (see box, above). Unlike its four-year institutions, the state’s community colleges are the creation of the legislature and not the state constitution, and each of the state’s 28 community colleges has its own local governing board. However, according to Dan Phelan, president of Jackson College, the state has a voluntary association of all 28 community colleges, called the Michigan Community College Association (MCCA). Despite the variation among governance structures from state to state, all community colleges are governed by citizens who are not necessarily professional educators. This system of lay governance reflects the democratic structure adopted by each state and local community in different parts of the country. Community college governing boards provide oversight to public community and technical colleges throughout the nation. Legal, fiduciary, and ethical responsibilities are engaged when they appoint CEOs, approve appointments and billions of dollars in expenditures and ensure institutional compliance with regulatory requirements (Public Community College Governing Boards, ACCT, 2012, p. 1). Resources: Community College Systems Across the 50 States and Public Community College Governing Boards: Structure and Composition, ACCT, 2014. GISS is a national initiative that provides education for community and technical college trustees and presidents to assist them in data-informed governance to promote student success, equity and completion and career readiness. Visit https://governance-institute.org/ for more info. © Copyright ACCT. All rights reserved.